Hearty and filling, milk-based soups can often serve as meals by themselves. 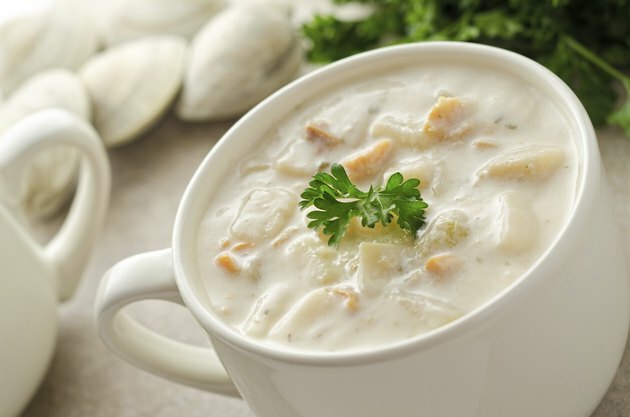 Milk-based soups, such as chowders and purees, are thicker and creamier than broth-based soups, meaning that they make for a more filling meal. If you find that your soup pot hardly has a dent in it after dinner is over, the rest can be saved for future enjoyment. Keeping soup in the refrigerator puts an emphasis on consuming it quickly, but freezer storage buys you more time. Place the pot of soup in a shallow ice bath in your sink to bring down its temperature. Allow the soup to cool for 15 to 20 minutes. Ladle the soup into jars or rigid airtight plastic containers. Leave 1/2 inch to 1 inch of room at the top of the container. The soup can also be ladled into ice cube trays to solidify in the freezer before being transferred into freezer bags. Mark the date clearly on the container, bag or jar. Use a permanent marker or homemade label. Place the soup gently into the freezer right-side-up to prevent accidental spills and leaks. Soups can remain frozen for up to six months before they should be consumed or discarded. Given that milk-based soups have a tendency to separate when frozen, it’s best to reheat them in a double boiler and straight from the freezer rather than thawing them first. Stir the soup constantly to ensure that the ingredients remix.